Popular thought holds that America in the affluent postwar decades avoided extremes and shared a common set of convictions that can be briefly defined as a confidence in American-style capitalism and the democratic abundance it generated; distaste for class conflict; dedication to social unity at home and to anti-communism abroad; interfaith cooperation; and, by the early 1960s, support for civil rights. 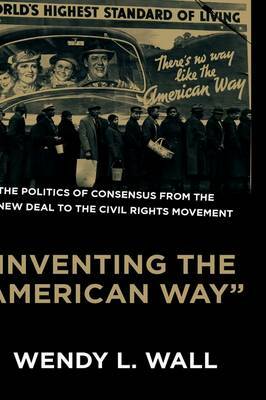 In this book, Wendy Wall looks at how and why Americans of diverse backgrounds and divergent political views agreed upon a need for and put forward a unifying set of national values. She particularly focuses on three groups: businessmen and advertising executives, government officials and cultural elites, and a loose collation of activists and intellectuals. they collectively launched a sweeping campaign to educate Americans on essential civic values, using radio, television, universities, and advertising. In this detailing of what was in fact a period of culture wars, Wall exmaines the birth of such concepts as 'free enterprise' and the 'vital center' that contiue to be used by politicians today. Speaking to those in multiple fields, this book will appeal to readers who enjoyed such books as Gary Gerstle's American Crucible, Daniel Rodgers' Atlantic Crossing, Mary Dudziak's Cold War Civil Rights, and Elizabeth Borgwardt's A New Deal for the World.